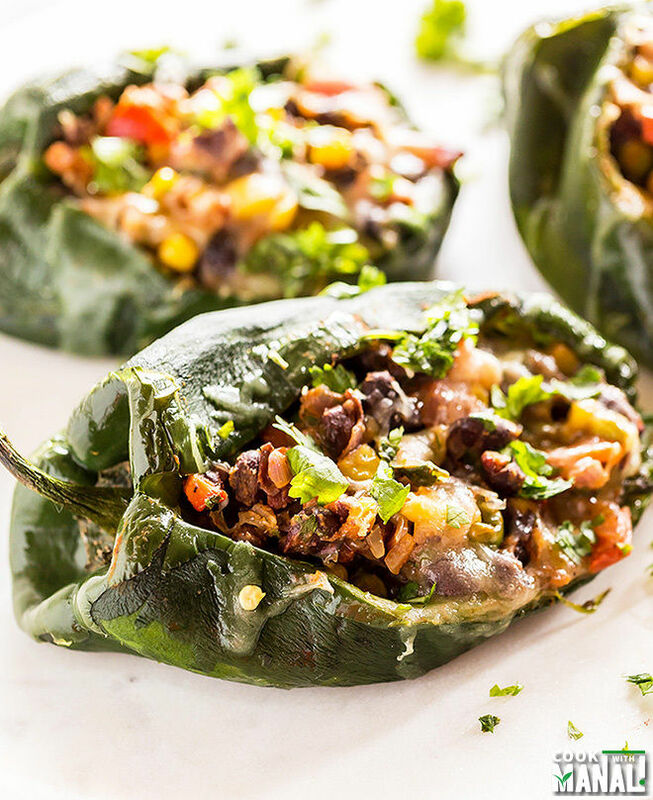 Vegetarian stuffed poblano peppers are stuffed with black beans, corn, pepper, onion & peas! Topped with cheese, they will be a great addition to your Thanksgiving table! Yesterday was quite a day for both India and America. While America voted and chose it’s new President, back home in India Prime Minister, Mr. Modi banned Indian currency notes of 500 & 1000 rupees with immediate effect to tackle corruption and black money in the country. It was a day of chaos, all I could read everywhere was Hillary, Trump and Modi! My mind was exhausted by the end of it and I am just glad it’s all over and done with. Now moving on to better things like food and Thanksgiving dinner. Like I mentioned in my previous post, I will be sharing vegetarian main course recipes this week for Thanksgiving. 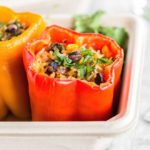 So today I am sharing with you these Vegetarian stuffed Poblano Peppers. 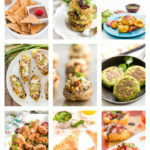 They are really flavorful and one of my favorites! I have always loved eating poblano peppers but I don’t buy them enough. I mean, not as frequently as I would buy jalapeno. There’s this Mexican restaurant in the city, where they have an awesome vegetarian dish with roasted potatoes and poblano and I always order that when we are there. It’s so flavorful that writing about it is making my mouth water. I am a fan of that dish and I actually got poblano peppers to recreate the same dish but ended up making these stuffed peppers. I served them with some mexican rice and it made a very filling meal. 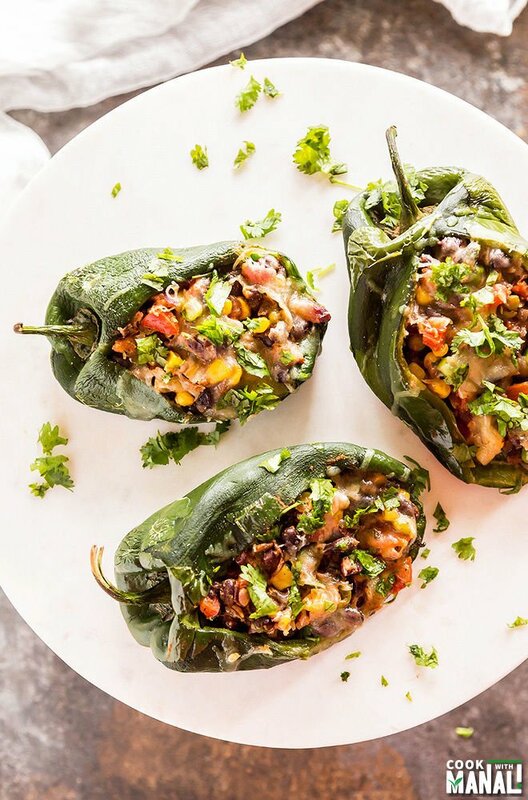 These vegetarian stuffed poblano peppers are stuffed with black beans, red pepper, corn, green peas and onion. 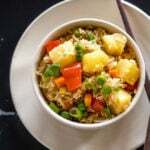 You can add whatever you like in there, actually rice would be a very good option too to make it a complete meal in itself. And there’s some cumin, cayenne, paprika and my favorite ancho chile pepper to spice things up. And of course there’s some cheese but not a lot of it because you guys know me – I am not a cheese fan. So please adjust the quantity of cheese to taste and preference. The poblano peppers that I used in this recipe were pretty big as you can see in the picture. I got them from the local farmer’s market. The filling would probably fill double the number of poblano peppers if they are smaller. Since mine were big, I was able to fill 3 peppers with the filling. 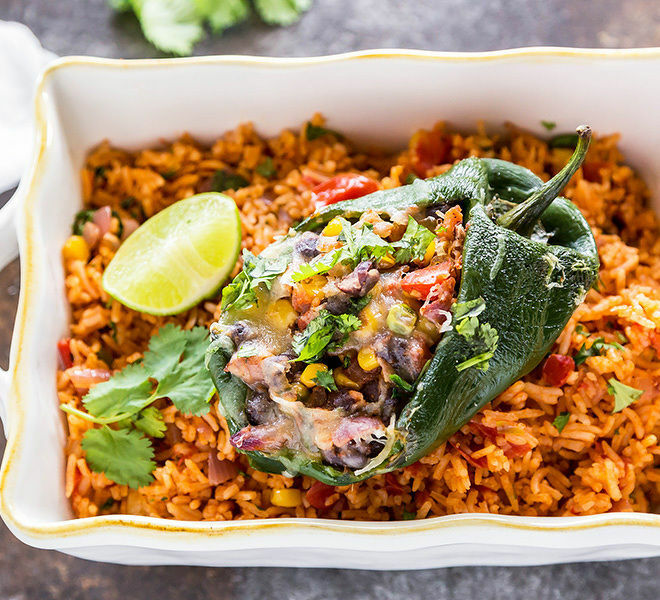 Hope you guys give these vegetarian stuffed poblano peppers a try this Thanksgiving! * Heat oven to broil. Line a baking sheet with aluminium foil. Brush the poblano peppers with oil and place on the sheet. Broil for 5-7 minutes or till light blisters develop, changing sides once is between. While the peppers are in the oven, make the stuffing. Heat oil in a pan on medium heat. Add chopped onion and garlic. Cook for 2-3 minutes. Then add the chopped tomatoes and cook for another 2-3 minutes. Now add corn, green peas, chopped red pepper and black beans. Add all the spices, salt and cook for another 2 minutes. Also add in the chopped cilantro and remove pan from heat. Squeeze in some fresh lime juice. The stuffing is now done. Once done, remove the peppers from oven, let cool for 2 minutes and then peel the skin as much as possible. Make a cut in center, remove the seeds. Meanwhile pre heat oven to 375 F degrees. Stuff the filling into the de-seeded peppers. Sprinkle cheese equally on top of the stuffing for all the peppers. Place into the oven at 375 F degrees for 10-15 minutes or till cheese melts. 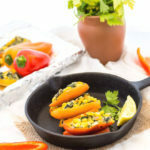 Serve these vegetarian stuffed poblano peppers immediately! * Please be careful while handling poblano peppers. Especially when you remove the seeds, wear gloves and afterwards wash yous hands immediately. * Adjust the quantity of cheese to preference and taste. You may use any cheese of your choice, a Mexican cheese blend would work great here! 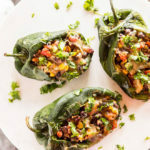 Vegetarian stuffed poblano peppers stuffed with black beans, red pepper, corn, peas & onion. 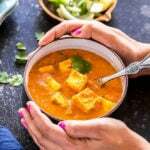 Topped with cheese & spiced with cumin, paprika to make a hearty and delicious vegetarian meal! Heat oven to broil. Line a baking sheet with aluminium foil. Brush the poblano peppers with oil and place on the sheet. Broil for 5-7 minutes or till light blisters develop, changing sides once is between. Place into the oven at 375 F degrees for 10-15 minutes or till cheese melts. Serve immediately! Best stuffed peppers I have ever seen! Well done, Manali. Indeed it was quite a day for India and America. These stuffed peppers look stunning, Manali. Loving the ingredients you have used in stuffing. I definitely don’t eat enough poblano peppers either, though I love them! 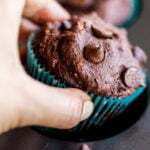 This recipe is just what I need to get back into it. 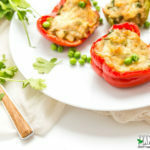 I love the flavors of these stuffed peppers, Manali! Thanks Gayle! You need to eat more poblano peppers! What a lovely and colorful dish, Manali! Pinned! I love poblano peppers but I’ve never stuffed them! These look just incredible, Manali! I can see it! Why can’t you see it Poornima? Yeah hope so too! Poblano inside burrito is great ! These stuffed peppers look amazing, Manali! 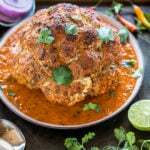 Love the flavors and that you used poblanos! awesome! glad you liked it Rich!